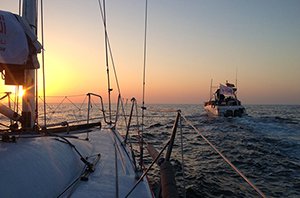 The morning is here – its the final leg for Sailing Arabia The Tour. Today the third place finish is up for grabs between us and the TU Delft Dutch Team. A better spirited kind group of wonderful young men I have never met. Whoever prevails, its been an honor and a pleasure sharing this tour with them and sailing against them. The tour has been quite a journey. We have seen the pro-team EFG Bank find their footing early on, and dominate the race as expected, and as I have previously mentioned our team’s results already achieving the goals I had personally set for this event. Today we will be match racing against Delft, but our maneuvers and nuanced trimming simply are not equal to theirs, as we have four very new sailors who still are learning the roll tacking and gybing. Yesterday was Leg 6B ~ of what ended up being a two-part leg from Dibba to Mussanah. The wind was forecast to be a light sea breeze, but then to die all night, making arrival to Mussanah impossible on the timeline we needed for todays start. The amended plan was then to race the afternoon through the parked ships outside the Strait of Hormuz, and make our way down the rumbline until 6 pm. Then motor all night and reach Mussanah. After a quick rest, we then would have a day race. Which we did. Unfortunately, during the amending on the water, the race committee unfortunately transposed a number on the way point of the first afternoon finish – although at the finish it affected no one because it was clearly stated again and again over the radio that we were to finish leaving the committee boat to port. We all did. It was a line up going in. Messr Frankfurt, led by skipper Marcel Herrera and navigator Cory Rousselle caught the mistake on the paper, and instead of going straight headed up after finishing. Since we were on his tail, literally, we thought it was to avoid us. Well, although they weren’t prejudiced by the paper mistake, their plan was to protest the committee and get everyone thrown out – which is what happened. It doesn’t change their position overall but it did knock us to fourth place. And left bad tastes for many in the fleet. We and Delft had asked about the protest flag enroute to Mussanah – unaware of the technical mistake on the amendment, and they denied that it was about anything. Inport racing: The afternoon race found the Delft team loosely match racing us, going into their epic high mode off the start line and getting a small jump on us. This pretty much stayed the positioning through the race, and they finished ahead of us. We looked for opportunities to take a passing lane to attack, but when the wind shifted far right we had a parade into the finish line again, and it was pretty much done. 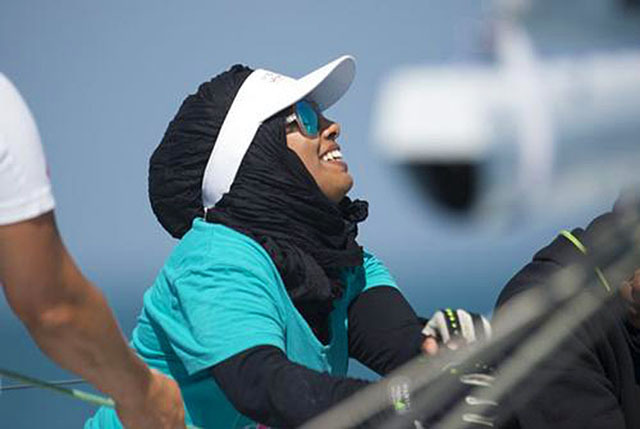 The Omani women were still happy to beat their brother boat, Team Renaissance, and are very happy with what they have achieved. What’s next? Our two Oman Sail instructors, Huda and Khuloud, will continue to teach sailing to guests and kids, although I believe they will remain available to race on occasion. Huda really showed promise as a trimmer, and I told her yesterday how pleased I was with her progress, and hoped she would continue. Ibtisam will continue to race on the team, and will continue to take on a boat captain role. Raaja- who was not with us and was to have skippered the team – apparently will come back to the program to do more sailing. 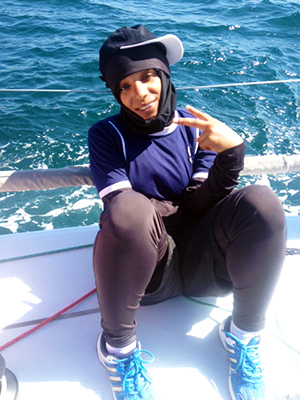 Raham, from the Oman Navy, will go back to her duties in the Navy but will occasionally race with the team. Raja, who missed SATT because of emergency surgery on her wisdom teeth, will also continue racing. 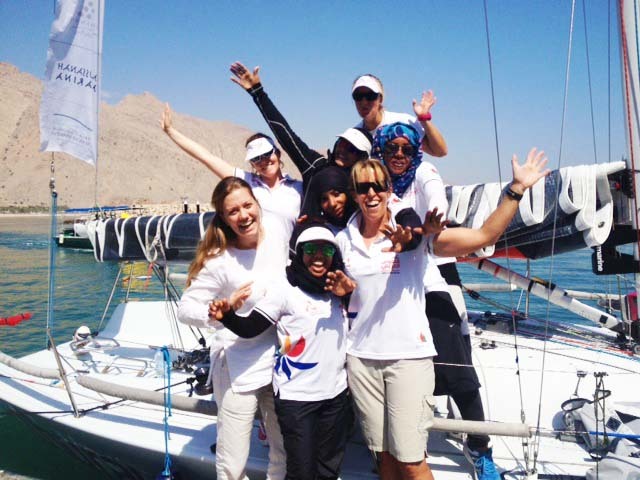 Oman Sail has plans to reach out and develop talent in young women, and try to identify those in athletic programs already to see if they will give sailboat racing a try. Their commitment to the program, and their efforts are extraordinary and are such a gift to the region. It is an honor to be a part of it and see their work. Small steps, but incredible opportunities here. After the finish and today’s prize giving, there will be a dinner with the event sponsor at Muscat’s Opera House. I hope to be able to thank him personally for his vision and support. It will be a nice way to end this year’s Sailing Arabia The Tour. Leg 7 Results ~ TU Delft Dutch Team raced ahead, for an exciting first place finish! This victory resulted in an overall third place for them, and put the Omani Women’s Team into fourth place for SATT 2014. Read more about Leg 7. What an amazing journey! More to come. The day has arrived to finally leave this slice of heaven – Six Senses at Zighy Bay – where we have been resting for a day after the challenging 104-nautical mile leg 5 from Ras Al Khaimah to Dibba. This amazing resort has sponsored the all-women’s team, and we have been absolutely blessed with staying at their villas, and of fantastic hospitality. The resort is ecologically friendly, focuses on sustainability and simply is a “must” if you are in the region. All of us wish we had another day here, and were joking we should sabotage the race committee boat so we would have to stay! The weather forecast has been for light wind, and we were generally intending to motor for awhile till the wind fills in. However, today’s forecast by Predict Wind looks more promising, so perhaps we will get sailing sooner than previously anticipated. The game is on with Delft Challenge, as currently only .25 separates us in 3rd and 4th position. Normally we would plan on match racing them, but on Leg 6 – 140 miles from Dibba to Musannah – combined with the fact that they have a couple of points of sail that we simply cannot match, we have to use that strategy plus one to simply win. Their maneuvers are tighter than ours as well, so if we get into a gybe/tack-off – it won’t go well for us. 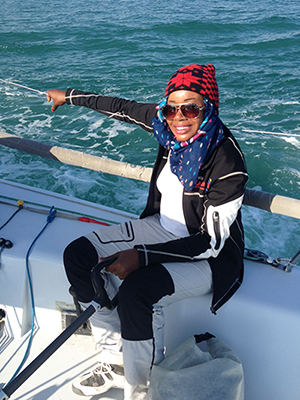 Yesterday we turned the boat over to the Omani women to race, and were onboard simply to coach. Epti drove, Huda trimmed, Khuloud took the bow, and Raham the mast. It was very light wind, so we only got one race in. They did a great job though, and we found that they definitely have been learning and picking up more than we thought. I believe that they defer to us as the experts, so previously it was hard to know where they exactly were in their development. It is very encouraging and I was pleased to see how far they have come. They also came from behind to beat their brother team, Rennaissance, so they were very excited. Later they put the boat away as well – folding sails, putting flags up, etc. It was really cool to see. Only two legs left. Whatever happens I am extremely happy with what the team has achieved and am looking forward to the last two legs of SATT! Sailing Arabia The Tour (SATT) – a 760-nautical mile course that spans over four countries from Bahrain to Muscat, Oman, with eight of the region’s premier marinas playing host as stopover venues during the seven legs of the course. Leg 5: Close race & another podium finish! After getting through to the other side, we headed down the coast with light wind. It was one of those euros-to-zeros back to heroes kind of race. The forecast had called for big winds and reaching, but the cliffs protected us. It was a long night of very nuanced sailing with weight movement. We sent the Omani women below often to get rest, because weight was also good to have inside the boat while mostly wind/reaching in light fare. At one stage I saw clouds developing onshore, and knowing that the edges of clouds were windows, we headed closer to shore. We jagged our own little shore breeze, that the other boats who were farther out off-shore did not have. Quickly we passed the fleet and were in first! R – Raham interview, M – Huda trimming and L – Eptisom at helm. However, EFG’s skipper, Sidney Gavignet, is a professional and never gives up. He quickly headed to shore and caught up with us, and ended up passing us not far from the finish line. The wind was crazy at the finish, which was deep in a bay of fishing pots, with 180° shifts. EFG and Mezze Frankfurt passed by staying offshore, further away from some cliffs that were not helpful. We ended up in third place at the finish line, which puts us in third overall at this stage of the Tour. Our team learned a lot, and were very excited to finish in front of most of the fleet again. Today we are giving back to our sponsors, and will have guests onboard. There are no points for today. It will be interesting, because we are going to have the Omani women practice all the racing positions. It is a great opportunity to give them good coaching, while racing without cost of points. They continue to learn that this is a team sport, and everyone has to work together in unison. One of the big lessons this past week has been learning about different responses in different conditions – like moving lightly and gently while hoisting a spinnaker, compared to hoisting a spinnaker in bug winds where aggressive, fast, hard body movements are used. Two more legs left, and we sit in third. My expectations for the team have already been exceeded, and I am very happy with what the team has achieved. We will continue to try to obtain a first or second podium finish, but it’s all a bonus at this stage. I will be interested to see where the Omani women go from here. 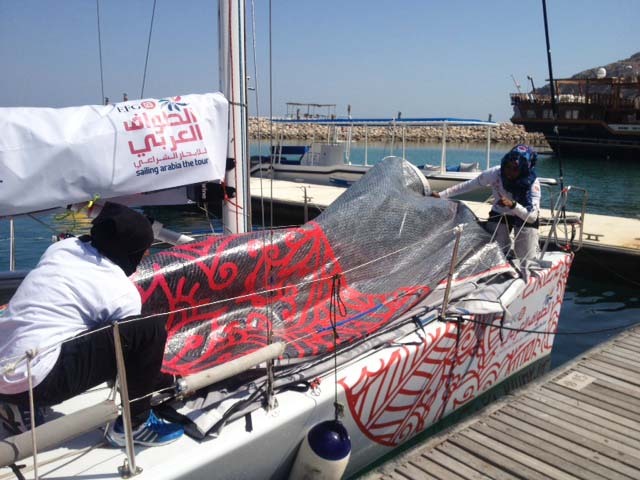 Two of them originally instructed children in the Oman Sail Program. The other is on loan from the Royal Navy, and I will be curious if she will continue sailing or will return to her duties there. Time will tell.